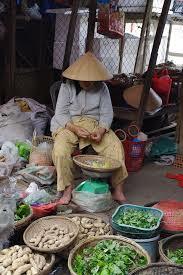 Home / News / Hoi An - A melting pot of history, architecture, colour and cooking. 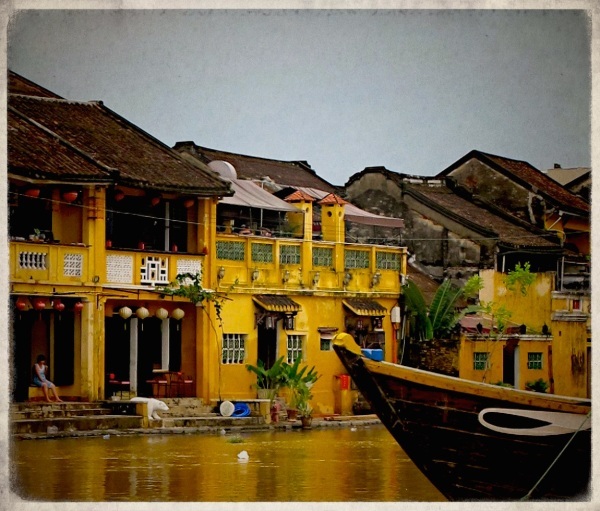 Hoi An – A melting pot of history, architecture, colour and cooking. Since the 1990s, Vietnam has slowly grown in appeal, firstly to back-packer travellers but as the infrastructure has improved and evolved to more discerning visitors seeking comfortable hotels, excellent local cuisine and a rich and diverse culture. 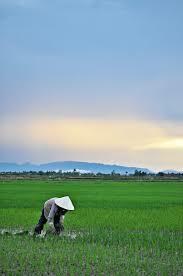 Vietnam provides experiences of the senses- visual and taste. 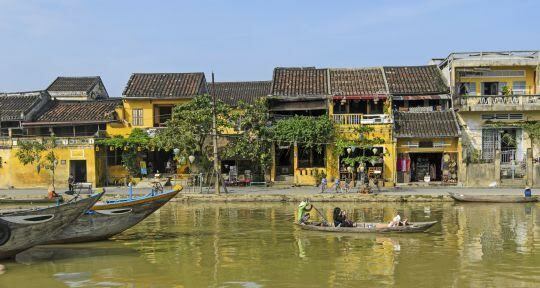 The Unesco World Heritage town of Hoi An in central Vietnam is a kaleidoscope of vivid colours, life and architectural styles and Vietnam’s most atmospheric and delightful riverside town. 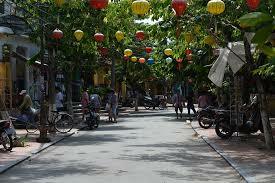 I visited Hoi An in Vietnam back in January 2014 but remember it like yesterday. It etched a place in my memory and in my heart. It is difficult to know where to begin to describe it to someone who has never travelled there as there is so much to see, do and experience. I will however try! The vibrancy and colour of Hoi An is perhaps the first thing that hits you. It is a beautiful and friendly place full of colourful street markets, flower markets, street vendors, tailor shops, and cycle drivers. There are families cooking and eating on the street, many inviting you to sample the local food. Cookery classes are everywhere and taking part in one of these is a must. The one we chose took us to the market first to buy our ingredients and then back to a spotless kitchen to cook with the restaurant owner and then eat the fruit of our labours. The only decision that is difficult to make is which dishes you want to master. Hoi An is a wonderful place to wander around with its well-preserved Ancient Town, cut through with bustling canals. The former port town’s melting-pot history is reflected in its architecture, a mix of eras and styles from wooden Chinese shops and Japanese merchants’ houses, temples, tea houses, French colonial buildings and ornate Vietnamese tube houses. 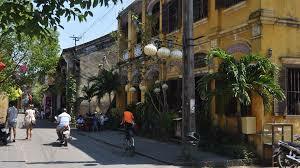 We managed to get lost several times but found that to be a great way to explore Hoi An. We never felt unsafe and there were always people delighted to talk to you and put you back on the right road. A visit to the iconic Japanese Covered Bridge with its pagoda is a must by day and by night. 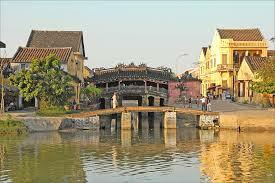 It is considered to be emblematic of Hoi An. A bridge was first constructed here in the 1590s by the Japanese community to link them with the Chinese quarters. Over the centuries the ornamentation has remained relatively faithful to the original Japanese design. The French flattened out the roadway for cars, but the original arched shape was restored in 1986. There are many tales and legends around the bridge, depending on who you talk to, but whoever you believe, it is one of the must see places. We felt blessed to be in Hoi An especially as the sun went down. Restaurants and tea houses spill out onto the streets and you are faced with the hardest decision of all….. where to have dinner? The food is outstanding and we really enjoyed watching the chefs from the luxury of our table, produce amazing dishes from simple fresh local ingredients. Colour is all around with night markets and the sparkle of night lanterns all around. Every month there is a full moon festival. These festive evenings feature traditional food, song and dance along its lantern-lit streets. Definitely something for me to go back for. Whether you love architecture, street life, food or a rich traditional culture , I would say that Hoi An has it all. 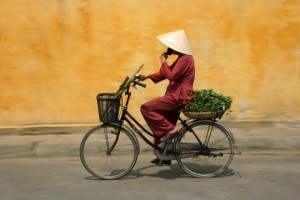 Venture a little distance on the roads outside Hoi An and you’ll find emerald green rice paddies, girls in traditional dress and wearing palm-leaf conical hats, fishermen in small wooden rafts, children riding buffalos and much more. If you haven’t been to Vietnam then I strongly recommend you go to Hoi An. ""Thank you Lucy for giving us such a wonderful time. I so appreciated your expertise and your personality. I learned so much and very much appreciated my time painting with you. Eileen's support was wonderful and made everything go so smoothly from the moment we left Heathrow until our return. I enjoyed meeting everyone and sharing such special times together, both arty and spiritual. This was a trip of a lifetime and I'll never forget it." "